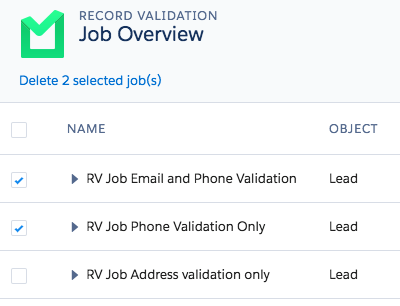 From the Record Validation Job Overview page, you can start a new Record Validation Job or view results of already completed Record Validation jobs. You can also check the status of currently running jobs, export reports, validate or auto validate records. Expanded Record Validation Job ready for further actions. Progress Current progress status of the job. Records The number of unvalidated records that are found while running the job. Validations Number of unvalidated records shown in their current status color. When an RV Job is expanded, it shows more information about it. Started By Shows the user that started the job. Started Time and date job started. Ended Time and date job ended. Validations Used Fields selected for validation in the job. Record Status Status of all records involved in the job. Results button Navigates to the Record Validation Results Overview page. Add new Job button Opens the 'Start a new job' panel. Learn more about how to start a new Record Validation Job on this page. Getting Started Links to useful information in our knowledge base. Navigates to useful tutorials in our knowledgebase. Job Filter. Learn more in this article. Open or close all duplicate groups, expand or hide the duplicate records. Results Navigate to the Record Validation Results Overview page. Report View the results in detailed graphics style. Auto Process Start an automated validation process. Learn more about the Auto Process in this article. Note that if you delete a job from the Record Validation Job page without running a validation, the data returned from the job search will be lost. If you rerun the job it will cost you credits again.